Miss Beauty Saver // A British Makeup and Beauty Blog: FREE Hand Cream from The Body Shop worth £5! FREE Hand Cream from The Body Shop worth £5! 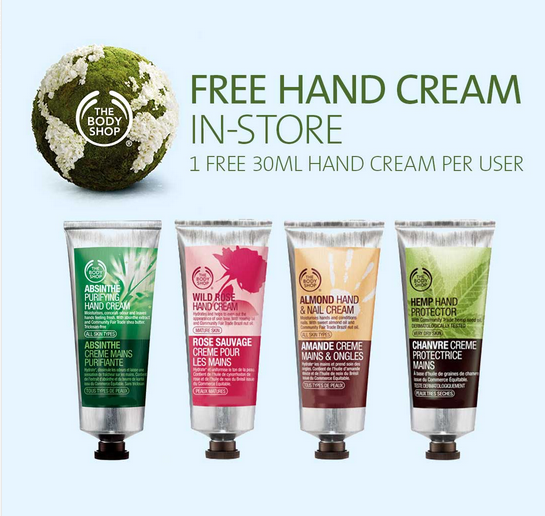 The Body Shop are currently offering a free 30 ml hand cream worth £5 (with no spend required). Then you can choose to either download their app and get the virtual code or print off a physical voucher with the code on. You then take your code into a participating Body Shop store where you can redeem it for one of four 30 ml hand creams. Simples! If you're anything like me (a beauty product junkie), you'll no doubt find this to be exciting news! I picked mine up a couple of days ago and I'm so pleased with it! I chose the Wild Rose Hand Cream with SPF 15 but there are also three other varieties to choose from. I'm actually planning a rather large Body Shop purchase at some point when I have used up some of my quite large stockpile of excess beauty products! (Any other beauty bloggers out there found themselves in that position!?) I really want to take advantage of one of their 40% off sales at some point and I need a Love Your Body Card in my life! When I went to redeem my voucher in store, the lovely shop assistant very kindly showed me some gorgeous looking products and she was very helpful. However, I had already resolved not to make any impulse purchases before going in and amazingly I actually stuck to that decision! So please remember: there is no need to make a purchase in order to get the free hand cream. If you want to, then great, but don't feel pressured into it! Most Body Shop stores seem to be participating in this offer but I believe there are a small number that aren't so it may be a good idea to check the T&Cs if in doubt or before you make a special trip. As always, offers like this are subject to availability and may sell out fast. I think that this offer runs until 29/09/2013 so there are 8 days left! I didn't experience any problems at all with this offer so I hope you all find it as easy as I did to go and get your hands on one of these free little beauties from The Body Shop! I'm really pleased with this hand cream, my first impressions are it is very moisturising but the formula is light and easily absorbed. Plus, the scent is amazing! Like I mentioned earlier, I'm feeling a big body shop purchase coming on at some point soon because they do such great products and this hand cream seems to be no exception at all! Will you be trying to get your hands on a free hand cream from The Body Shop?